For more than 25 years, Dane has established his reputation in the community as a high-level events planner and fundraiser for various charitable organizations. Some of these include; The American Cancer Society, Hospice, Relay for Life and various Veteran organizations. His background in communications and public relations allows him to create events that effectively communicate the message of his clients. Dane is a 3rd generation Florida Cracker. By some mistake of fate, Dane was not born in the "olden" days of the horse. But he was lucky enough to be born into a horse-oriented family. Dane was blessed to have lived a life exposed to many of the unsung horsemen of their day. Dane has won numerous Mounted Police Competitions in Equitation, Jumping, Dressage, Fleeing Felon and Day & Night Obstacles. He has been a member of Lake County Sheriffs Mounted unit where they have received many Gold Medals in Mounted Drill Team Competitions. Dane was also a finalist on Craig Cameron’s “Extreme Cowboy Race” on television. He holds clinics on Obstacle training and judges competitions. He is currently a Level 5 in Cowboy Mounted Shooting. He was Florida State Champion, Georgia State Champion and Southeastern US Champion at different competition levels. Dane finds fulfillment retraining "problem" horses and finding them good homes. Dane is a member of the AQHA, NFQHA, APHA and NRHA. He is currently working on a book about his unique Horse communication and philosophy titled; “Our Silent Partner”. Although newly arrived from the state of Oho, Joyce is not new to Florida. She worked 3 years as an assistant breeding manager for Char-O-Lot Ranch, known for their world champion Appaloosas and Quarter horses. While living in Lee County, she won a photo contest with over 300 entries, which led her to study art and photography at Ringling School of Art. Joyce started training horses as a teenager. By performing in diverse events, this led her horses to be sold for fox hunting, jumping, race track, trail, halter, barrels, and most of all Cowboy Mounted Shooting. Her biggest claim to fame is the Quarter Horse, Eighty Six Gin, currently owned by Cody Clark of Columbia, TN. They have achieved multiple World Championships, set 16 world records, and won 3 consecutive Eastern Championships, which has never been done before! Cody’s dad, Rock, had previously purchased a Paint gelding nicknamed “Joker”, which Joyce bred, trained, and competed on. That team also won state, regional, and Hi-Pt CMSA year-end awards. Another champion QH/Paint mare, “Rosie”, was bought and campaigned by Mark Hallink. This team ended the 2017 year winning Hi-Pt in CMSA for Rifle, Hi-Pt Paint, and numerous other titles. Joyce, herself, has been CMSA Hi-Pt Midwest Regional Cowgirl for 12 different years since 2001, when she first started shooting. She also has won multiple state, region, and year-end awards showing Quarter Horses, Paints, and Pintos. While at Black Horse, Joyce will be accepting a limited number of horses for training, and will occasionally have quality horses for sale in different disciplines. Her goal is to “Develop better horse and rider partnerships through calmness and versatility”. Moving from South Florida, Don has lived in the Ocala, FL area since 2002 with his wife of 44 years. They own a small farm, horses and dogs. Interests include traveling, trail riding, mounted shooting, obstacle challenges, golf and many more activities. Don did not own horses or grow up on a farm until 2004, where he met a cowboy that gained his trust to steer him in the right direction in buying a couple of horses. That’s when he started trail riding. 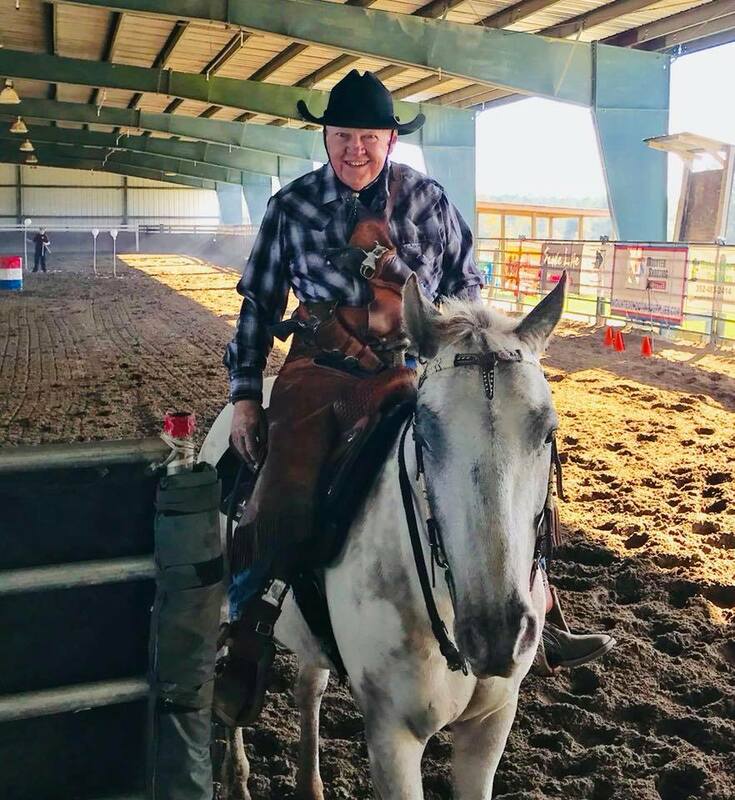 After seeing a show on TV where city slickers went to a ranch for 7 days to see if they could live the cowboy way of life, including Cowboy Mounted Shooting, he just had to try it. After attending an obstacle challenge, Don decided it would be fun to create his own and invite riders to compete. Halloween in the park – Florida horse Park, over 700 people attended. 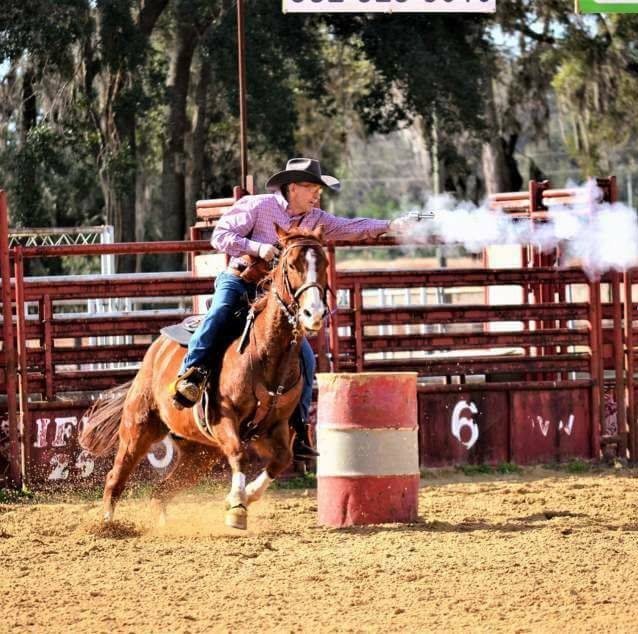 Extreme Cowboy Race – Florida Horse Park. First in State of FL. 90 riders. Second Extreme Race – Florida Horse Park – 75 riders. Monthly obstacle practices – Florida Horse park. Bi-Monthly obstacle challenges – Florida Horse park. Partners in Xtreme Horsemanship Race – Black Horse Ranch & Resort, Umatilla FL. 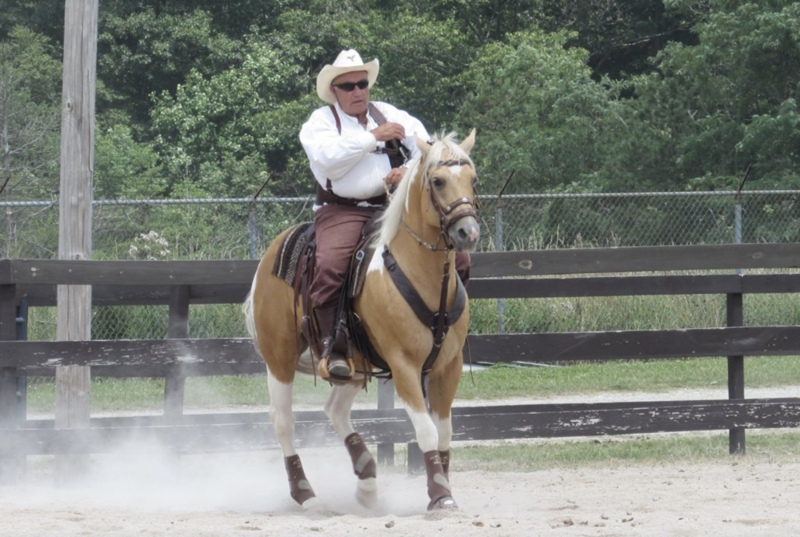 Mounted shooting practices – Florida Horse park. Christmas In The Park – Florida Horse park. Over 500 people attended. Hospice fundraiser at Village Polo Fields – raised over $25,000. Hospice fundraiser at local ranch in Villages. Cowboy mounted shooting skit, square dances, cook out. Fundraiser for Orlando Horse rescue. Provided announcing and sound services at Kissimmee rodeo. Mounted shooting demonstration. Mounted shooting demo at Dog and Pony Show at Ocala Equestrian Center. Mounted Shooting demo at Livestock pavilion Ocala, FL. Design extreme stages at local club mounted shooting competitions. Managed arena at local equestrian ranch, Ocala FL. President of local SASS shooting club. Board member local CMSA shooting club.